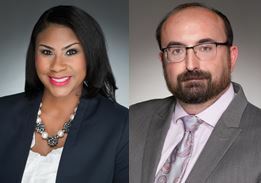 FORT WORTH, TEXAS (October 10, 2017) – Goodwill Industries of Fort Worth, Inc. announced today the promotion of Marc Thompson to director of compliance and job resource centers and the new hire of Karmen Rubin as director of employment programs. As director of compliance and job resource centers, Thompson will be responsible for ensuring the nonprofit is compliant with all local, state and federal grants as well as internal policy and procedure for workforce development programs. Prior to his promotion, Thompson served as the Job Resource Center manager, and has served in supervisory positions at FedEx and Walgreens. Thompson graduated from Baylor University in 2005 with a bachelor of arts in political science and government. He is a member of North Texas Lead and Steer Fort Worth and has served as a mentor at Dallas Life Shelter. As director of employment programs, Rubin will plan, direct and coordinate client outreach and relationship management activities related to providing services to clients within the GoodwillWorks program including referral for internally and externally provided assistance to homeless clients and their families. Prior to joining Goodwill Fort Worth, Rubin served as a global business developer for Walter P. Moore and Associates, and was a member of the workforce development team at Goodwill Industries of North Louisiana, Inc. for more than five years. She received a Master of Business Administration from Louisiana State University Shreveport in 2015 and a Bachelor of Science degree in Health Studies Management and Marketing from the University of Louisiana at Monroe in 2010. Active in the community, she served as communications director for the Society of Professional Marketing Services (SMPS), was a 40 Under 40 Award Nominee by the Shreveport-Bossier Chamber of Commerce in 2013 and is a general member of Alpha Kappa Alpha Sorority, Inc.